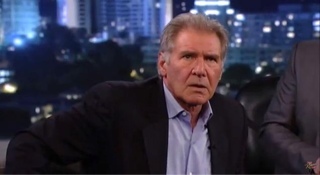 Actor Harrison Ford got bleeped on TV on Wednesday as he let the ‘f’ word slip while talking about his experience on the baseball mound at Dodgers Stadium in Los Angeles on Monday. The movie star tossed the ceremonial first pitch on the hallowed turf as part of the Dodgers’ tribute night to sporting hero Jackie Robinson. Ford, who stars as the club’s late general manager Branch Rickey in the new Robinson biopic 42, admits he was inundated with advice from friends after they learned he would be taking to the mound. The Star Wars star’s effort wasn’t great – but he admits he refused to take heed of the advice he was offered, telling late-night chat show host Jimmy Kimmel, “I got a lot of conflicting advice from all kinds of people that pretended to know how you throw out the first ball. Realizing he had uttered a swear work on national TV, the actor paused and covered his mouth with his hand.